Recognizing the need for an authoritative and permanent body to oversee the development of ADR in our state, the Alabama State Bar, and the State Court Circuit and District Judges Associations petitioned the Alabama Supreme Court to develop such an entity. As a result, the Alabama Supreme Court created, by order effective July 1,1994, the Supreme Court Commission on Dispute Resolution. Instituting necessary guidelines for the orderly progress of alternative dispute resolution programs and procedures in the state court system. Providing technical assistance, education and training to the bar, the judiciary and the public. Developing training procedures, qualification criteria, standards of conduct and utilization standards for mediators and other alternative dispute resolution neutrals. 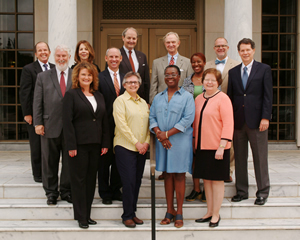 The commission oversees the operations of the Center of Dispute Resolution and serves as a focal point for the supervision, coordination and implementation of the broad development of ADR in Alabama, both in the state court system and the public at large. Within the latter context, the commission assists in the development of, for example, neighborhood dispute resolution projects and school conflict management programs. The commission also works closely with Administrative Office of Courts and the state bar committee on ADR in many areas involving ADR studies. one which eventually will become a model for other states. William P. Cobb II, Esq. Term Expires: December 31, 2018 William D. Coleman, Esq. 716 Richard Arrington Jr., Blvd N.
Mediation Clinic Dir. & Clin. Asst. The Commission considered your request for an ethics opinion at its meeting on June 28, 2013. The undersigned Defendant further waives any notice required by law as a condition precedent to taking of depositions in any way permitted by law and the rules of this Court; and specifically agrees that depositions may be taken herein by affidavit before any Notary Public or other officer authorized to administer oaths and when so taken may be used like other depositions, as provided by Rules 28 and 29 of Alabama Rules of Civil Procedure, and hereby consents that this cause proceed to final judgment without further or other notice whatever to said Defendant. Is the inclusion of this paragraph in the mediated agreement, when requested by the court, ethical? If I prepare this as a separate document to be signed at mediation, is this the preparation of pleadings which is unethical? If the inclusion in the agreement and the preparation of separate document is unethical, how do you suggest that I comply with the instructions of the court? The Commission opines that a mediator cannot coerce a party into entering a settlement agreement or require the parties to include particular language in the agreement. See Alabama Code of Ethics for Mediators, Standard 4 (b) (as amended through June 1, 1997). Although inclusion of the statement in a memorandum of settlement may not be substantive coercion, the Commission opines it runs afoul of the broad principle of self-determination that is the bedrock of mediation. Therefore, the answer to your first question is No. The Commission further opines that the answer to your second question is Yes. Because question three is not a question about mediator ethics, the Commission declines to answer it. The Alabama Supreme Court Commission for Dispute Resolution responds to your request for an opinion whether certain mediator conduct is allowed or prohibited by the Alabama Code of Ethics for Mediators (as amended, 1997) (hereinafter, Code). The Commission understands that the Circuit Court for the Tenth Judicial Circuit adopted the Birmingham Differential Case Management Plan, Civil (Revised, Sept. 2008) (hereinafter, Plan), and cases may be referred to mediation in accordance with he Plan. The court issues a mediation order that refers a case to mediation, and the order directs who must appear at mediation and with settlement authority. You are the Court mediator, and the court appointed you as mediator in the case and set your hourly fee. The parties did not object to the amount of the hourly fee. You convened mediation but withdrew, and a new mediator resumed the mediation. The second mediator terminated the mediation without a settlement. After the mediation was terminated, the parties negotiated, and you were told the case may resolve if the mediators agreed to reduce their fees and sign the settlement agreement. Specifically, one of the lawyers for a party requested that you and a second mediator reduce your fee as consideration for a release of (1) potential claims against you for claimed mediator negligence during the mediation, and (2) claimed unethical conduct during the mediation. You refused the offer. In addition, you believe one of the parties violated the court's mediation order because not all parties on one side attended the mediation, and the party that did attend did not have any settlement authority. Finally, you state that because the parties agreed to caucus mediation, only the mediator may have been aware of these facts. The case settled without the mediators reducing their fees and they did not sign the settlement agreement. The court ordered the case dismissed with prejudice. The mediators' fees are not paid. attended a mediation; (4) does the Code allow a mediator, who is mediating under the Plan, to report to the court that the party that attended mediation did not have any settlement authority; and (5) can the mediator report to the court that her mediator's fee is not paid. Because the case is dismissed with prejudice, the Commission fmds questions 1 and 2 moot. representative of the insurance carrier for any insured party who is not such carrier's outside counsel and who has full authority to settle up to the amount of the plaintiffs last demand or policy limits, whichever is less, without further consultation. Willful failure of a party to attend or participate in the mediation should be reported to the court. (emphasis supplied). Discussions during mediation are confidential. The judge does not rule on disputes arising in the course of mediation and the mediation proceedings are not part ofthe record of the case." agreement to disclose information gathered during the mediation." (emphasis supplied). The Mediation Rules apply to court ordered mediation, and Rule 11 governs confidentiality of information "disclosed in the course of mediation". Section 6-6-20 (c) is part of the Alabama Mandatory Mediation Act, and it and A. R. Civ. P. 37 allow a court to impose sanctions on a party that fails to mediate as required by the Act. compelled to disclose statements made and actions taken during mediation. Rule 11 (d). stated: "The failure to have all persons or representatives attend .. "' is conduct that a party, but not a mediator, may report to court as a basis for monetary sanctions." Campagnone at 572. The court further held that reporting anything more may violate confidentiality rules. Based on Campagnone and § 6-6-20(c), a party, but not the mediator, can report that a person or representative required to attend mediation did not attend. It appears that the only reason for the compliant party to report this conduct is to obtain monetary sanctions, and this is not part of the mediation proceeding or process (Rule 1(a), § 6-6-20(a), Standard 3). It is neither the duty nor responsibility of the mediator to act on behalf of any party in this regard. If, for whatever reason, the opposing party is unaware that a required party does not attend, the Commission's opinion is the mediator can withdraw or terminate the mediation. Standard 3(b). The Commission believes the same reasoning applies when a party appears at mediation without settlement authority. First, under the Plan the party is not deemed to have appeared if he or she does not have any settlement authority. Second, assuming this is conduct and not information gathered during the mediation, it is conduct for which the compliant party can seek sanctions, if desired. The remedy of sanctions is the party's, not the mediator's. The mediator's option is to withdraw or terminate. The Commission's opinion is a mediator mediating under the Plan cannot report to a court whether or not a party attended mediation, and cannot report to a court whether or not a party had settlement authority; therefore, the answers to questions 3 and 4 are no. The mediation is terminated and the case dismissed, but the mediators' fees are not paid. This is a situation that is not part of the mediation proceeding, or information disclosed in the course of mediation, or information gathered during mediation. The Commission's opinion is the Code does not prohibit the mediator from reporting to the court that the fees are not paid. The answer to question 5 is yes. May a retired circuit court judge, upon retirement, accept mediation appointments from circuit judges when the case being referred may at one time have been assigned to the retired circuit judge? Does the extent of involvement in the case make a difference? For example, if the judge merely had signed a HIPAA motion requesting documents, or accepted a mutually agreed upon scheduling order, would such acts preclude the retired circuit judge from accepting the appointment as a mediator? Should the retired judge accept cases for mediation if the retired judge previously had made a ruling in the case that was dispositive of some issue and in favor of one party over the other party? A retired Judge may accept referrals for mediation made by another judge who had been a judicial colleague of the retired judge. If the retired judge previously had some involvement in the case, he or she must fully disclose the extent of that involvement to all parties to the mediation and allow the parties to request another mediator if either party feels any concern over the inability of the retired judge to be fully impartial. The greater the retired judge's involvement in the case, the greater his or her Responsibility to evaluate whether he or she can remain impartial and Whether the appearance of lack of impartiality may cause any party to be uncomfortable with the judge as a mediator. The concern about lack of impartiality might not occur until after the parties have engaged in some mediation sessions, and the mediator's actions or words have been evaluated by the parties as being impartial or not, thus the mediator should err on the side of refusing an appointment if there is any doubt in his or her mind about how the question of impartiality may be perceived by the parties. (See Standard Five, Alabama Code of Ethics for Mediators). Specifically to this opinion, the mere act of ruling on a motion, such as discovery request or HIPPA request, in most cases should not automatically preclude a retired judge from accepting an appointment as a mediator in the same case. If in ruling on the motion the judge has received information ex parte, or otherwise, which is not known to the other party, the retired judge should decline appointment as a mediator. In all cases where the retired judge has made rulings dispositive of some issue in the dispute, the retired judge should decline to serve as mediator. Ruling on a dispositive issue suggests that the retired judge already has determined that one party is right and the other party is wrong on an issue in dispute. The likelihood that the losing party could accept the retired judge's impartiality in mediating on other issues seems so great that the Commission finds that the retired judge should decline appointment as mediator to avoid the appearance of impropriety. In considering whether to accept appointment as a mediator in a case that previously was assigned to the retired judge, however slight the judge's involvement, the retired judge should keep in mind that parties may be more intimidated in expressing their feelings about impartiality due to the friendship relationship between the retired judge and the appointing judge. It is therefore important that the retired judge be conscious of this potential concern and develop a non-threatening way for the parties to express their view that another person be appointed as mediator. If the parties, or either of them, express a concern about the retired judge's impartiality, it is the duty of the retired judge to withdraw from service as mediator and inform the court only that he or she is unable to serve because of a conflict of interest. The details of the conflict of interest should not be shared with the appointing judge. The freedom of choice in having a mediator with whom all parties are comfortable should be the overriding consideration.